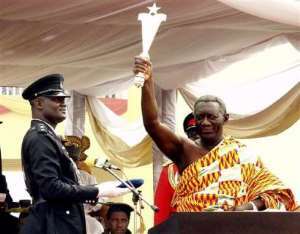 Accra, Jan. 7, GNA- President John Agyekum Kufuor was on Friday sworn in for a second four-year term following his victory in the December 7 election. Wearing a rich kente cloth, he took the Presidential Oath and the Oath of Allegiance administered by the Chief Justice, Mr Justice George Kingsley Acquah. He swore on the cross. Vice President Aliu Mahama also took the oath of office. He took the oath of the Vice President and the Oath of Allegiance. He swore on the Koran. He then signed the oaths he swore. The ceremony took place at the Independence Square, which was turned into a Parliament. The function was attended by thousands of people from all walks of life. Several West African heads of state and dignitaries from several countries also attended the swearing-in.